I just came back after reading the LG G6 review by digitaltrends.com. I have to be honest that I although I agree with their opinion about the wide-angle lens, the sample images that I've seen, including theirs, show very limited dynamic range. You can take a look at the camera samples they put on their website. Take a look at the image of the fountain in Barcelona. Everything that is very dark appears like pitch black. The image looks like it has black stains on it because of that. The low dynamic range just make subjects with dark tones appear almost completely flat. It's not just in that image, it appears in many of the sample images. It just makes the images look really weird to be honest. Even the 'Apple Market' indoor image with arches below the ceiling and the lamps in the middle, the fence lacks details and look almost completely black. The only thing that gives it its 3D look is the bright light that changes the reflection of the parts that are more exposed to light. A sensor with high dynamic range would have revealed more details in those dark tones across all the images. Take a look at the outdoor image (image 1-13). That image was taken in a bright daylight with little amount of clouds in the sky. It looks a bit artificial and here again, people with dark clothing look like dark spots in the image. The image looks more like a scene from the game Borderlands than a natural scene. Of course some image look better than others. Even sample images on androidauthority.com show the same signs of limited dynamic range. I also think that although the dynamic range is limited, what makes it even worse is that the image seems to have some contrast boost in post processing that worsen that issue even further. What's weird is that everyone praised the camera and no one mentioned that. I just look at the sample images and really don't like what I see. I mean I like the wide-angle field of view, I love the pictures themselves, but if we talk about image quality or sensor's performance, there is something lacking. When I first saw some LG G6 camera samples, I didn't really know what I didn't like about them. They looked weird, not all of them, but some of the image. Now I think that I was able to figure out the issue, and this is the low dynamic range and probably also the boost in contrast that makes very dark areas in the photos appear pitch black and flat. 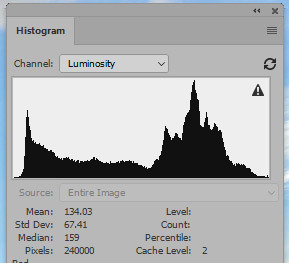 I've downloaded some of the images and put them into Photoshop to check out the Histogram. The luminosity has right-skewed distribution and there is strong presence of dark tones in the daylight images and the histogram shows a chart of a high contrast image. There suppose to be better luminosity towards the mid-section, bu in many of the images that I've seen it's not like that. It's not that the black is completely black, but it's very close to that for most of the very dark areas of the image. In a well-balanced image, the details in the dark areas should be much more opened up and should reveal significantly more details. This is something that I found lacking on the LG G6 across many of the camera sample that I've seen on many popular phone review websites that posted camera samples taken with the G6 rear-facing cameras. You can check out the LG G6 sample images yourself one digitaltrends.com here. I am waiting for DxOMark tests to see what their test results will show. It looks more like a image processing thing. I think that the contrast and color boost might cause this. Sony's sensor, even the ones with the small 1.12 micron pixels are known to have pretty good dynamic range. You can clearly see in the photos that the colors are extra vivid and image have high contrast, more than you usually get to see. Maybe this is the reason for that, not completely sure though.